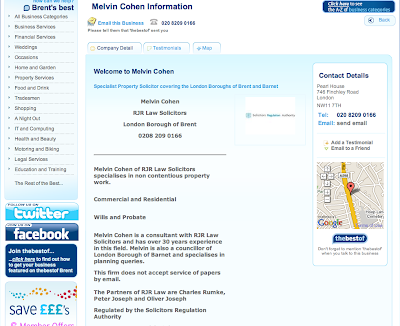 On a similar note, have people noticed that our old chum Brian Coleman often uses FRSA after his name. One of the things made very clear by the Roal Society of Arts is that Fellows should not use these letters after thier name, if especially if it is intended make themselves look as if they have some sort of qualification. He is even using it on the LFEPA web page. I wouldn’t worry gingis. Nobody thinks Brian Coleman is qualified for anything other than rampant snout-in-the-troughism and being vile and abusive. But DCMD, he does is artfully, no?